I’m going to start collecting tips and sharing them…Two on Tuesday, ok? Cool. Make sure you get the two tips next Tuesday by subscribing via email! Basically, I packing tape one hole, with a little bit of paper so it’s non stick on the inside of the well… I have, in the past, used double stick tape to tape this to my tray table/lap desk/workbench, but in each location I wound up getting too cocky, started talking with my hands (I’m a passionate hand talker…), and kablammmm! small bits (headpins, ear wires, you name it) everywhere…. Thanks for the tips. 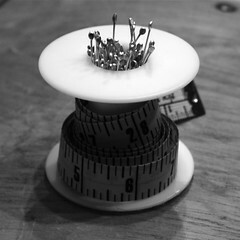 I especially like the idea of winding that pesky tape measure onto something handy! I sew and if I topped it with a little stuffed ball I’d have a place for my pins. No more hanging it around my neck, which can get a little twisty. I could also staple one end so it doesn’t come off, hmmmmmmm. Now to locate one of those spool dealies!